Eurowa is an authorized factory distributor for ZF automatic and mechatronic transmission, CVT, AWD/FWD and manual transmission parts. Our extensive inventory of OEM parts includes all the small individual pieces other mass marketers and jobbers do not carry. 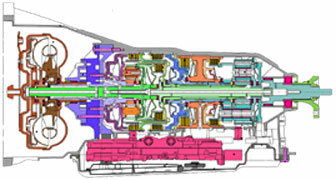 Since we rebuild transmissions, we understand that small things prevent timely rebuilds. Our experience is reflected in what we carry as a service to you, and so you can quickly satisfy customers. TO KEEP COST DOWN, we import directly from Germany OEM parts for Mercedes and Volkswagen factory transmissions, also Aisin-Warner and Jatco parts for newer Volkswagen 5- and 6-speed automatics. Hard to get parts for Audi and VW CVT transmissions are available from us. TO SOURCE HARD TO FIND QUALITY USED AUTOMATIC TRANSMISSION PARTS for Mercedes and Volkswagen, we import directly from Germany – particularly used parts for those older hydraulic transmissions where finding new is almost impossible or way too expensive. Our European suppliers keep us informed on availability, so even if we do not have the item on hand, often we can quickly get one for you. We carry a lot of used transmission parts in inventory to reduce repair costs for expensive assemblies like planetary sets. Each one is inspected, and comes with a 90-day warranty against part defect. Over 30 years of experience in rebuilding transmissions means we know exactly what to look at, and what parts will provide long term trouble free service. 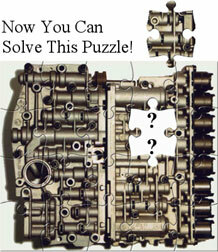 Do you need a rebuilt Valve Body for ZF, Mercedes or Volkswagen automatic transmissions? Our on hand inventory can save you hours of work and headaches. Using OEM parts, our technicians rebuild and test each one, and if we do not have a specific model, send us your core for complete reconditioning. If you want to rebuild your own valve body, Eurowa can provide you with the valve body solenoids, gaskets, valves and springs, etc., needed to do a proper job. NEXT DAY DELIVERY BY COURIER ON ORDERS RECEIVED BEFORE 14:00 E.S.T.